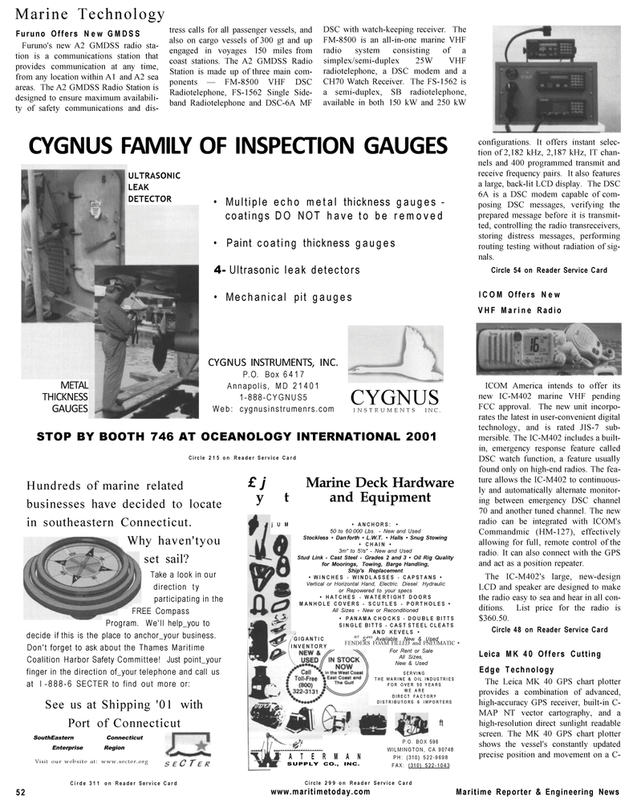 Web: cygnusinstrumenrs.com CYGNUS INSTRUMENTS INC. Program. We'll help_you to decide if this is the place to anchor_your business. FAX: (310) 522-1043 configurations. It offers instant selec- tion of 2,182 kHz, 2,187 kHz, IT chan- nels and 400 programmed transmit and receive frequency pairs. It also features a large, back-lit LCD display. The DSC 6A is a DSC modem capable of com- posing DSC messages, verifying the prepared message before it is transmit- ted, controlling the radio transreceivers, storing distress messages, performing routing testing without radiation of sig- nals. Commandmic (HM-127), effectively allowing for full, remote control of the radio. It can also connect with the GPS and act as a position repeater. LCD and speaker are designed to make the radio easy to sea and hear in all con- ditions. List price for the radio is $360.50.